NETWORK FINALS: The CMA AWARDS held at 2.1 in final numbers, putting it down 1.1 from 2017. All the other morning ratings remained unchanged as well. CABLE HIGHLIGHTS: ESPN’s Lakers vs. Portland NBA game led Wednesday cable at 0.96, with the early New Orleans vs. Minnesota game at 0.54. The season finale of FX’s AMERICAN HORROR STORY: APOCALYPSE gained 0.06 from last week to 0.81, which was down two-tenths from the 2017 CULT finale. Comedy Central’s SOUTH PARK rose 0.04 to 0.50, and THE DAILY SHOW made an unusual appearance in the Top 20 at 0.27. VH1’s BLACK INK CREW dropped 0.09 to 0.46. On Bravo, REAL HOUSEWIVES OF NEW JERSEY lost 0.05 to 0.40, and REAL HOUSEWIVES OF DALLAS was up 0.04 to 0.23. On History, FORGED IN FIRE slipped 0.03 to 0.34, and KNIFE OR DEATH was down 0.04 to 0.18. 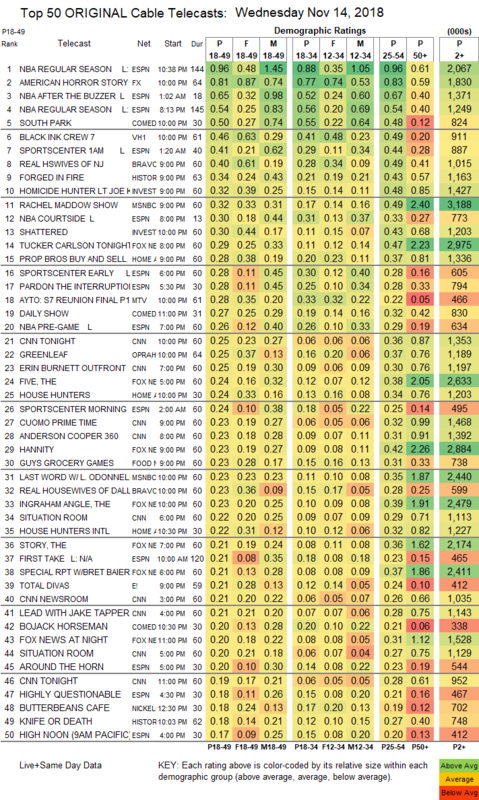 On ID, HOMICIDE HUNTER improved by 0.04 to 0.32, and SHATTERED was up 0.02 to 0.30. MSNBC’s RACHEL MADDOW SHOW led cable news at 0.32/0.49/3.2M, with Fox News’s TUCKER CARLSON TONIGHT at 0.29/0.47/3M, and CNN TONIGHT at 0.25/0.36/1.4M. On HGTV, PROPERTY BROTHERS climbed 0.04 to 0.28, HOUSE HUNTERS gained 0.05 to 0.24, and HOUSE HUNTERS INTL was up 0.03 to 0.22. MTV’s ARE YOU THE ONE ticked down to 0.28. OWN’s GREENLEAF ticked down to 0.25. Food Network’s GUY’S GROCERY GAMES dropped 0.05 to 0.23. 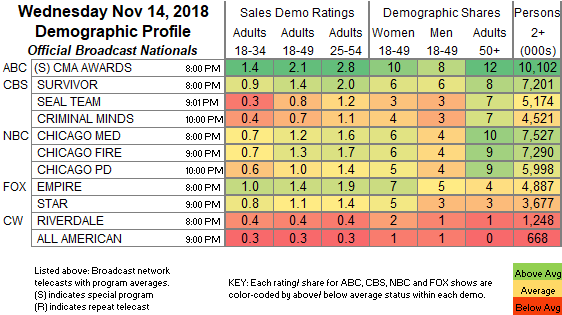 E!’s TOTAL DIVAS was up 0.03 to 0.21. A&E’s STORAGE WARS was at 0.17/0.16. IFC’s STAN AGAINST EVIL was at 0.05/0.04.